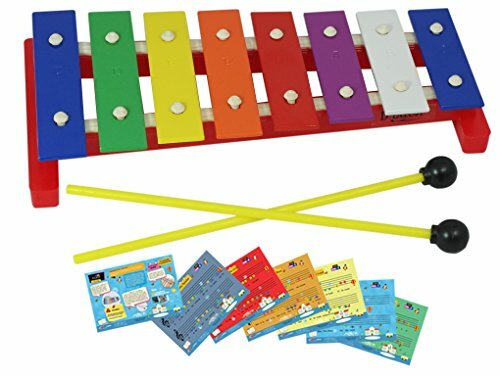 D'Luca 8 Keys Xylophone Glockenspiel is the perfect music toy for your children. With a solid sound, and a colorful metal bars this instrument is a wonderful gift for any child. Children will be expose to music at a very early age creating a great experience and improving eye-hand coordination, and memory retention. This Glockenspiel comes with an octave or 8 keys, colors are: Blue, Green, Yellow, Orange, Red, Purple, White and Blue for the octave note. It has a clean, crispy sound. Includes 5 easy to follow double sided music cards (included) to play 10 (Ten) classic songs such as Old Mc Donald's, Mary Had A Little Lamb, Twinkle Twinkle Little Star, and more! Includes 2 mallet, 5 Durable full color double sided Music Cards 4"x6" with 10 (Ten) classic songs, Quick Start Guide Card 4"x6". For ages 2 and up. WARNING: ADULT SUPERVISION REQUIRED. Please remove all packaging material before giving this item to a child. 10.25 Inches long by 5 inches wide approximately.